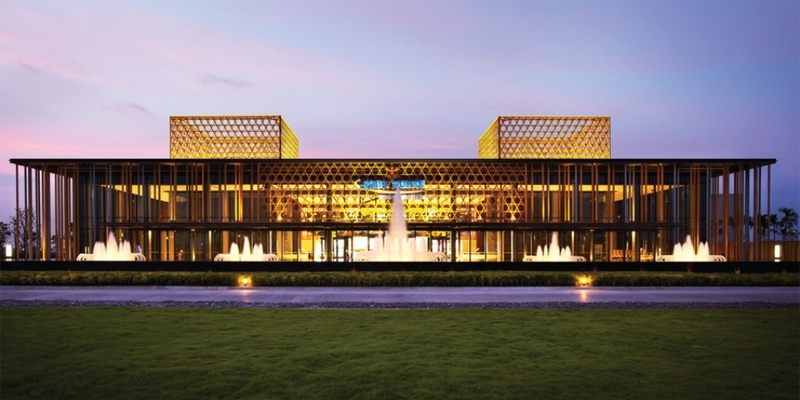 The King Power Srivaree Complex is only 15 kilometres from Suvarnabhumi airport, Its architectural design takes influence from local handicrafts along with other East Asian cultural influences, while having design features similar to the other two Complexes. The entrance façade is embellished in an eye-catching gold criss-cross pattern, likened to the weaving pattern that constitutes artisan square baskets inspired by the bamboo and wicker ware typically found in many Asian cultures. The façade doubles as a solar shield, while silver and gold are used throughout the Complex to convey an atmosphere of premium luxury to customers and visitors. The Ramayana restaurant here serves a delectable international buffet and can accommodate up to 1,500 people. Open : Daily 10:00 – 21:00 hrs.